Back in January I decided to better myself physically by exercising regularly. 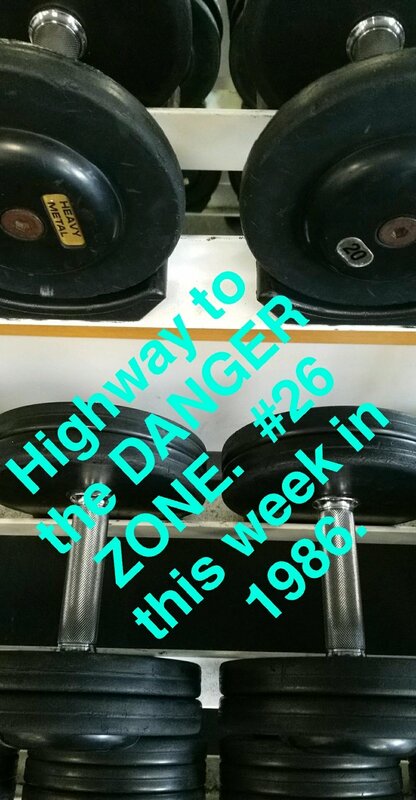 I was pretty “gangbusters” for the first three months and hit the treadmill & weights 7 days a week. Then the “aches and pains” for 45+ year olds started to kick in. So I backed off to 4 to 5 times a week. I realize now that I need at least 2 days a week to rest. Today I was on the treadmill (I have a 5K walk/run routine) and I pulled up the Top 40 Pop Hits Countdown from 1986. That is my favorite genre of music. 80s and early 90s. My growing up years through college. In the 70s and 80s, I listened to Top 40 hit radio in my hometown of Des Moines, Iowa. KRNQ was also known as Q-102. (Now HOT AC and known as Star 102.5). I had a walkman that I took on the bus with me to and from high school and had that station on the majority of the time. (You can probably figure out why I wanted do what I do for a living). By the way, I hate running. Always have, always will. This dates back to my late teen years when I had to do PT runs early mornings during my Army Training in the summers of 1988 & 89. I’ll never run a marathon, probably never run a 10K either. When I step on the treadmill, I turn up my favorite music and go into “robot mode.” Meaning I just FOCUS on the music and move my legs. I am proud of myself for getting into shape and had no idea when I first started how easy it was to do. Here’s to all the great music that pushes us to better ourselves physically and mentally. I don’t believe in New Year’s Resolutions. Most flame out after a few weeks. But I was sitting around my place on January 2nd thinking of how much spare time I had after work every day. I decided to make a lifestyle improvement and the next day I signed up for a gym membership at the local community center here in Maryville, Missouri. Today was day 20 of consecutive days I had gotten exercise. My workout regimen is 3 miles daily on the treadmill followed by weights that involve arms, chest and abs specifically. After just one week, I noticed how hungry I was throughout the day because of my increased metabolism. It made me feel good about myself. Eating many small meals is better than eating 3 large ones. My work day at the radio station begins at 5:00am. During my time on the air until around 9:00, I try to consume at least two 40 oz glasses of water. Making a concerted effort to drink more water and less soda. After work, I then change clothes and head right to the gym. I feel stronger and have more energy and don’t get cravings for as much junk food. My favorite junk food is COOKIES. But now I don’t feel as bad as having one or two a few times a week since I am exercising. The main reason for my early success is due to making exercise a ROUTINE. Health nuts stress making daily exercise a part of your every day activities so you also make it a HABIT. That’s what I have done. I haven’t lost much weight per say, but I know I am adding muscle mass and of course muscle weighs more than fat, so I am not concerned. But I have noticed I am fitting more comfortably into my pants. It’s very early in my process, but I am encouraged with what I am doing and I hope perhaps this short blog will prompt you to do the same, if you’re not already getting your heart rate moving daily. This is for a segment that will air during my high school football broadcast Friday. If you are on snapchat, add me at gconn08. What a crazy two polarizing months it’s been for my favorite pro baseball and football teams. First the Kansas City Royals. I got to an all time personal high 16 games during the regular season. 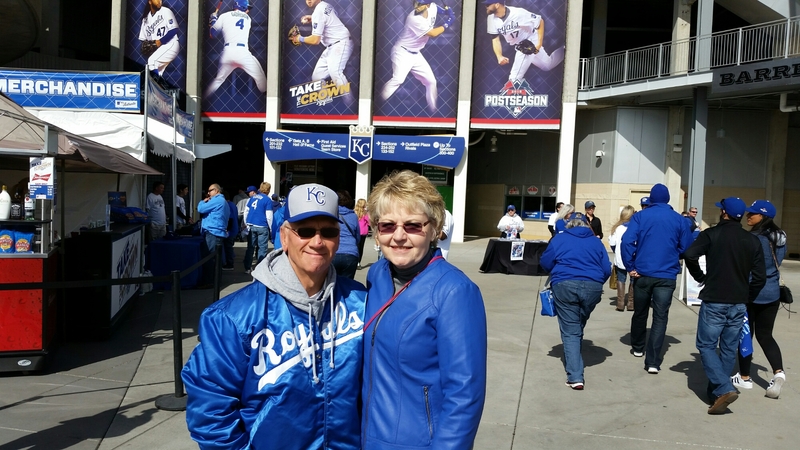 Great luxury to be up the road 100 miles in Maryville to see the Royals play at Kauffman Stadium. A few regular season highlights for me included seeing a walkoff homerun by Paulo Orlando to beat the Rays; waiting out a rain delay for two hours with my parents who drove down from Des Moines to see a win against the Toronto Blue Jays and a walkoff hit by Kendrys Morales to beat the LA Angels on Sunday Night Baseball. 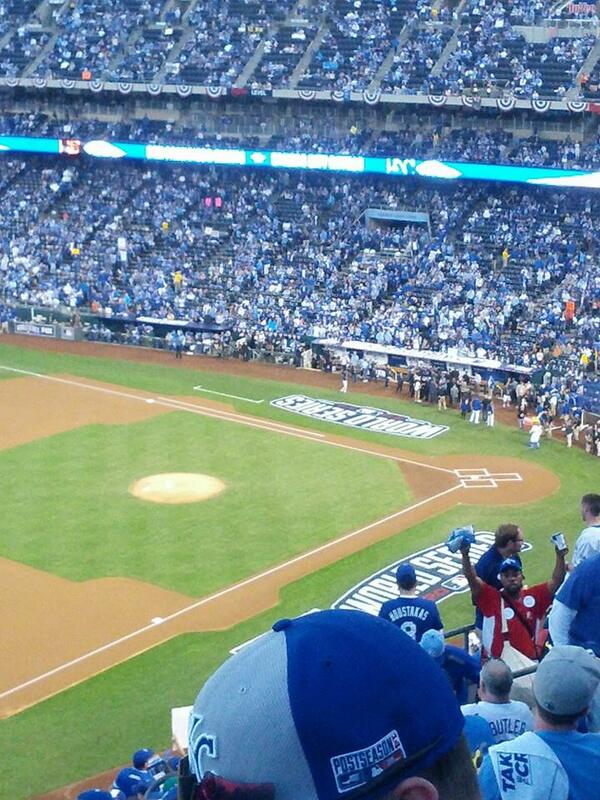 Saw three games in the postseason….including the Game #1 ALDS loss to Houston. But the highlight of that series of course was Game #4. I was watching that game and stopped watching after the Royals were buried. (Or we all thought they were). Down 6-2 after 7. Got into my car and went for a drive. After about 15 minutes I turned the radio on. 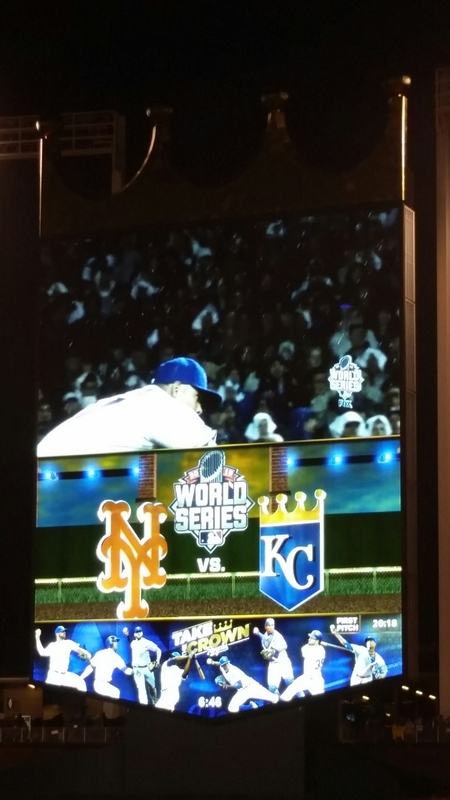 “….bases loaded,” said Royals broadcaster Ryan Lefevbre. Regained a bit of interest and began to drive back to my place. I didn’t get out of my car until that inning was over. KC scored 5 in the 8th and went on to win 9-6. In person for Game #2 of the ALCS. Down 3-0 in the 7th. Comeback to win 6-3 after another 5 run inning in the 7th. Bedlam at Kauffman. Took Dad (Don) & Mom (Lori) to the game with me. World Series opener. Rainy and delayed. So worth the wait. Alex Gordon bomb to force extras. Win in 14. I had to work the next morning. Got back to Maryville at 2am. Up at 4:30. Certainly no need to sleep that evening. To beat the Mets in Game #5 the way the Royals did was a perfect cap to the season. Down 2-0. Hosmer ties game in the 9th on a head first slide into home. Another extra inning victory. The Kansas City Royals are World Champions. Have been asked my opinion/reaction. I am not a typical Rams fan living in Missouri because they have been my team since the Los Angeles Rams lost Superbowl XIV to the Pittsburgh Steelers after the 1979 season. It stinks. It’s depressing. I am not “down in the dumps,” but not thrilled either. Caught literally in the middle. I had been to Minnesota twice to see the Rams before they moved to the Gateway to the West. My first ever Rams game in St Louis was the Divisional Playoff game against the Vikings in 1999. First play from scrimmage. Warner to Bruce. Touchdown. Complete and utter bedlam at the old TransWorld Dome. Will never forget how loud that place got. Pure excitement for me to see the Greatest Show On Turf in person. Made it back the following week to see a win over Tampa Bay in the NFC Championship. In later years, saw the Dolphins twice and the Packers once. Made it a total of five times to the Dome. I admit calling the St Louis Rams the Los Angeles Rams again is gonna take some getting used to. Never seriously thought the Rams would leave, despite all the threats. If you were a St Louis Rams fan, but won’t be a Los Angeles Rams fan, I understand. Don’t blame you. But for me, the Rams is the only team I have ever rooted for. Dad and me in 2012 for Rams vs Packers. Honor your father and mother. That is the 5th Commandment. As I have gotten older, I have come to appreciate my parents more and more. One of the good things that has come from me moving away from them nearly two years ago for a new job is that I have seen them more. Funny (or sad) but true. 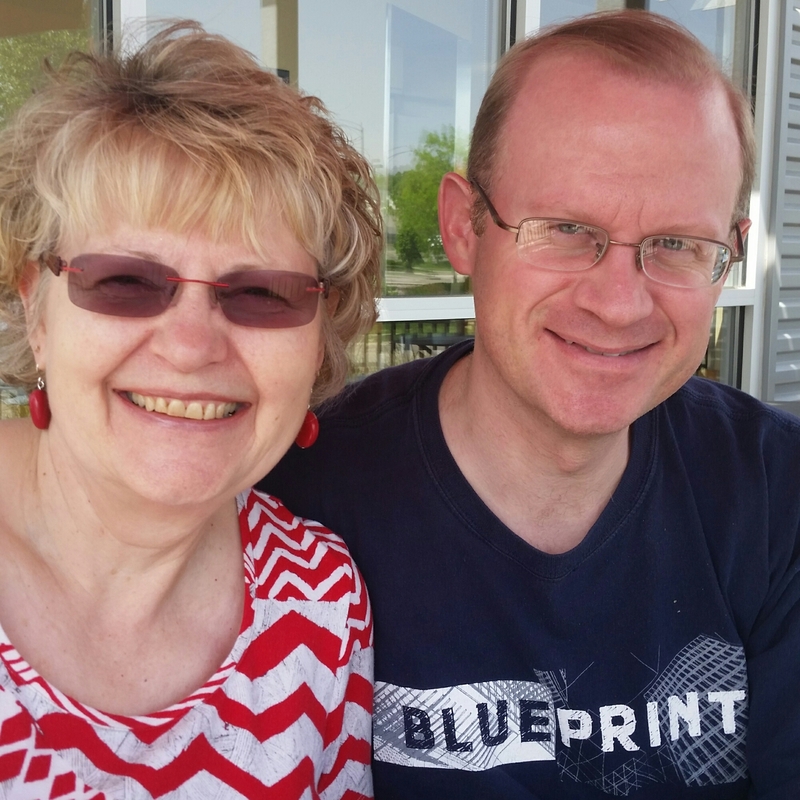 I am very blessed to have healthy, living parents. Sat next to them in church today. Thought about mom. How much she has shaped me into the person I am. During today’s sermon, pastor talked about how you should love your mom. VERBALLY. Tell her “I love you.” PHYSICALLY. Hold her hand, give her a hug. Perfect example of my mother Lori’s love for her oldest son came last August. As many of you know, I had an appendectomy. Routine surgery, not a big deal I know, but still kinda scary at the same time. My mother (and father) drove down the same day to be with me that night for my surgery. Spent the night with me in my room. It was comforting to not have to go through that alone. As I was leaving for church she gave me a small loaf of her famous homemade bread to take back with me to Maryville, MO today. That’s my mother, Lori. 2014 marked my first full year here in Maryville, Missouri working for Nodaway Broadcasting as the News/Sports Director for 97.1 The Vill (KVVL) and 95.9-1580 KNIM. It was a great year on the job and meeting a couple of social media friends in person. Through the first quarter, I called Maryville High School basketball and area county school games. This got me through the month of February. After about 4 weeks off, the Maryville baseball season began in late March. Still cold here during that time. There were a few early cancellations/postponements. April 28th was my father Don’s 69th birthday. That day I drove south about 100 miles to meet my friend Donlyn Turnbull for the first time. We’re both big baseball fans. She loves the Nationals and I of course the Royals. Donlyn works as the “New Media Director” for Tea Party Express. They were in the middle of a bus tour that started in Florida and ran through, Alabama, Louisiana, Texas and Oklahoma before stopping in Wichita and then Olathe, Kansas. It was great to see her and get acquainted for an hour or two before they had to pick up and leave and head for Iowa, Nebraska and Minnesota. The month of May brought another social media meeting. In February during a Maryville City Council meeting, it was announced that Janine Stange would be visiting. 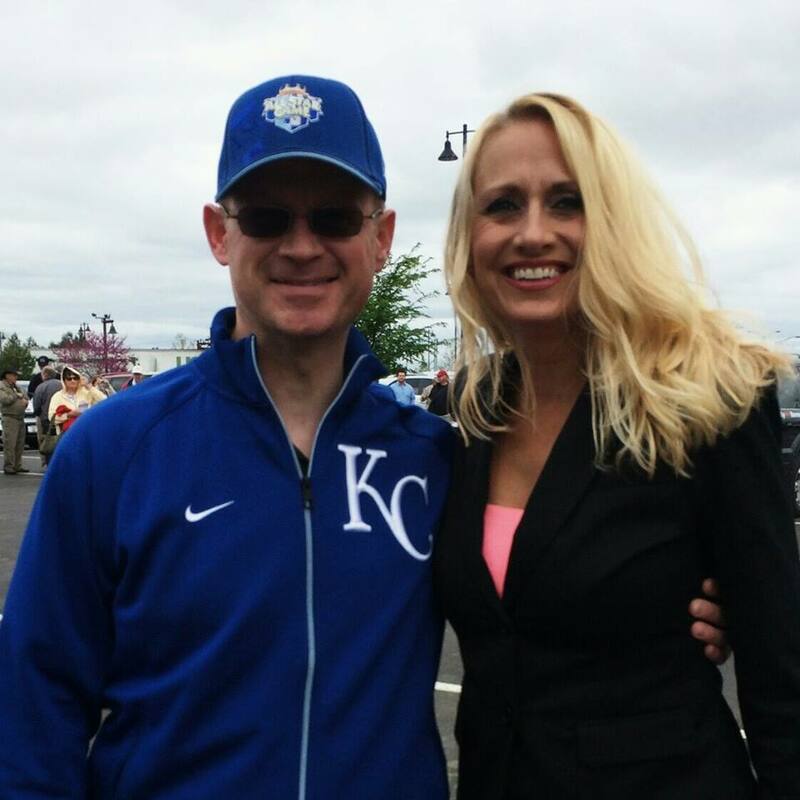 Janine is known as “The National Anthem Girl.” On August 28th, she completed her mission of becoming the first person to sing our anthem in all 50 states. Saturday of Memorial Day weekend, Janine came to Maryville to sing to lead off our “Country Music Festival” and made Missouri her 32nd state. The Thursday prior, she stopped in Clarinda, Iowa for state #30 and went to Omaha, Nebraska that Friday for state #31. If you haven’t already heard of her, she can be found online at nationalanthemgirl.org. Janine’s mission is to promote patriotism and honor our nations military. From June through August it was all about following the Royals. Getting to a handful of games. August meant time for the start of the high school football season. Maryville came into the year riding a 30 game winning streak. At that time, it was the 11th longest win streak in the country. Included back to back state championships. The Spoofhounds would carry that out to 42 games, before losing to Oak Grove in the state quarterfinals. Fantastic run. Neat to be a part of wins 16-42 in that streak. Now the finale. I have been a Kansas City Royals fan since the age of 9. 1980. That year the Royals made their first ever World Series against the Philadelphia Phillies. My brother Adam picked Philly, I chose KC. It’s stuck for the both of us. This fall was absolutely surreal for me. My team not only makes the playoffs, but proceeds to win 8 straight games in the playoffs before falling short against the Giants. I was fortunate to see 4 playoff games at Kauffman Stadium. Game #4 that clinched the ALCS against the Orioles and then Games 1-6-7 of the World Series. Amazing ride, so fun. Nice to be relevant again. I can’t thank Jeff Lantz enough. He got me tickets for the Series. Jeff and I go back to our days working together for the Iowa Cubs. 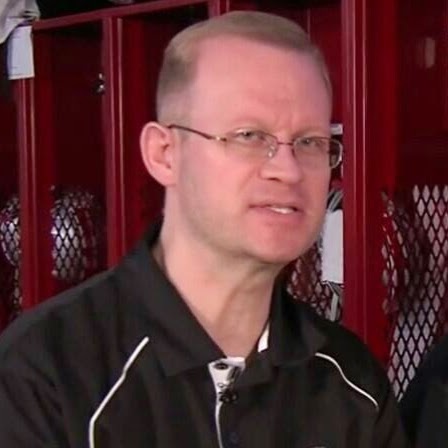 He recently left his job with the Baltimore Orioles to be Director Of Communications for Minor League Baseball. Best to you in the new position Jeff. My seat for Game 1. Happy New Year to all. Here’s to a great 2015. Today ended about a 72 hour period for me where things went from A-OK to rather serious. Sunday night I began to experience some discomfort in my lower stomach. Wasn’t sure if it was a simple stomach ache or perhaps I was hungry. As I was trying to fall asleep, the thought of problems to my appendix did occur to me. I didn’t sleep well, tossing and turning trying to get comfortable. When I woke up for work Monday, it was still hurting. After I got out of the warm shower, it felt manageable and I drove into work. I walked into the office at around 5:00 as per usual. Gathered the news and sports to prepare them for air. Recorded news/sports for KNIM without any issues. Then it hit me while I was sitting down. A strong shooting pain near the lower right side of my stomach. It scared me. Stood up to walk into my office and it became more severe. Bent me over. I couldn’t stand up. Became flush, felt very warm and I lost control of my breathing a bit. My boss walked past and noticed me grabbing my side and mentioned my appendix, which I was now 100% sure was an issue. He told me to record some news for The Vill and then head to the the emergency room. I was out of the building within 10 minutes on the short 2 minute drive to St Francis Hospital, just down the street from our studios. I checked in around 6:30. Took some blood samples. Finally got into get a CT scan around 10:00. 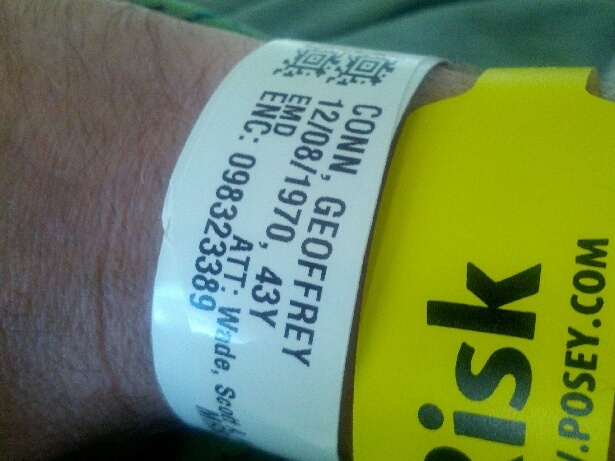 By 10:30 the doctor came and told me that the scan did not reveal appendicitis. He did say it looked as though the walls of my intestine were irritated and enlarged. Said I also could have colitis. Told me I could leave with a prescription, but he advised I be admitted immediately so that they could get me on antibiotics to try to reduce the swelling. I agreed. Later in the morning another doctor visited my room and said he was very concerned I had appendictis even though the CT didn’t show it. He pressed around my affected area and it became irritated. They took a few more blood samples. Doctor also told me he was trying to get a consult to come up from Kansas City because there were no available surgeons at St Francis. That doctor never showed. By then my white blood cell count had increased significantlly in a matter of hours. Calls were made and off to St Joseph’s Heartland Regional Medical Center I went by Nodaway County Ambulance. I had been in contact with my parents from Des Moines by then and they were on their way down to meet me. Shortly after we were on the road to St Joe, Mom texts me and says “we are right behind you.” After looking through the back window I texted back “perfect timing.” Mom texts back “God is in control.” It was comforting to have them both near. Surgery prep began and I was wheeled into surgery around 9:30. An hour later I was out and in recovery. Wheeled back into my room around 11:15. Mom and dad spent the night with me in the room. That was Monday. The surgeon visited me Tuesday afternoon to discuss what he saw. He described my infection as “juicy.” I had quite a bit of nasty stuff there. I asked him if we would have waited until Tuesday…..yes my appendix would have exploded. His main concern now was to keep me on antibiotics for another day before I could be released. My pain levels were rather low. A blessing. I was walking around the halls the next morning. The surgery now is very uninvasive. I have three small incisions in my upper, middle and lower belly. I am in very good health too. Realize this helped me begin to recover so quickly. I checked out at around NOON Wednesday. Mom and Dad helped me get some things at the grocery store because I am not allowed to drive for the rest of the week. Shortly thereafter they went back to Des Moines. I cannot say how much I appreciate them. Love them. Am blessed to still have them nearby. I got emotional when I said goodbye because I didn’t have to go through this event alone. If you messaged me on facebook or twitter. Thank you. I appreciate your friendship. It’s so great to have friends who support and care about you when you need it the most. Gonna be relaxing and doing nothing for the next 5 days before I head back to work on Monday. I have a follow up appointment in 3 weeks.